Canadian Dollar remains the strongest one today as boosted by the new trilateral USMCA trade deal with US and Mexico. Meanwhile, Sterling is shot up by news that UK Prime Minister Theresa May is ready to make a new offer on Irish border on Brexit negotiation. However, no details is known yet and the report is based on unnamed source. And more importantly, it’s in contrast to the hard line rhetorics we’ve heard today. The Pound could be hammered down quickly if it’s denied. On the other hand, Yen is the weakest one on strengthen in global stocks and yields. New Zealand Dollar follows as second weakest. European markets are notably boosted by the USMCA agreement, in particular DAX. At the time of writing, DAX is trading up 0.70%, CAC up 0.34% and FTSE up 0.17%. German 10 year yield is up 0.0284 at 0.501, back above 0.5 handle. However, Italian 10 year yield also rises 0.038 to 3.180, showing that concerns over the populist government’s budget are still there. Earlier today, Nikkei extended recent strong rise and closed up 0.52% at 24245.76. Singapore Strait Times reversed earlier gains and closed down -0.05% at 3255.46. China and Hong Kong were on holiday. Technically, the main focus in the US session would be on whether treasury yield will follow Germany higher. That would be a factor that drives up Yen crosses. 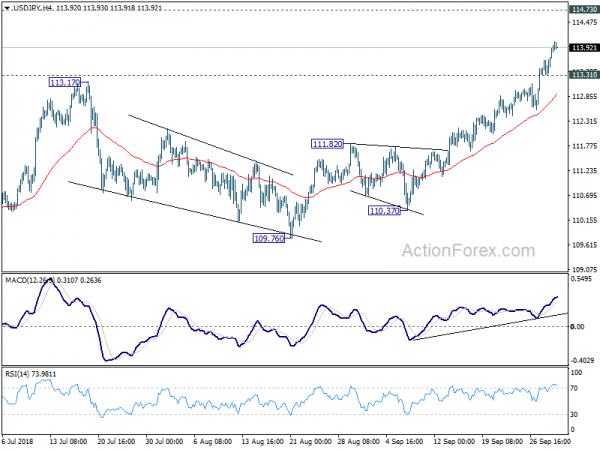 USD/JPY has already resumed up trend last week and is on course for 114.73 resistance, which is some distance away. But selloff in Yen could lift EUR/USD through 133.12 and GBP/JPY through 149.70. These two levels are worth a watch. Canadian Dollar was boosted sharply higher today last minute agreement that allow Canada to be included into US-Mexico trade pact. NAFTA is scrapped and the new agreement is called United States-Mexico-Canada Agreement (USMCA), replacing NAFTA. Mexico’s outgoing president, Enrique Pena Nieto should be able to sign it before leaving office on December 1. However, the pact still need to get approval from Congress which might be dragged into 2019. Canadian Prime Minister Justin Trudeau called it a “good day for Canada & our closest trading partners.” Jesus Seade, the Nafta negotiator for Mexican President-elect Andres Manuel López Obrador, said “Nafta 2 will give certainty and stability to trade.” Trump hailed that it’s a “great deal for all three countries”. A key element in the deal is that should Trump abuses Section 232 national security act to impose tariffs on global auto imports, Canada and Mexico will be exempted with quota of 2.6m messenger vehicles. Pickup trucks will be exempted entirely. Mexico will get auto parts quota of USD 108B while Canada gets USD 32.4B. Bother are significantly above existing production volumes. UK PMI manufacturing rose to 53.8 in September, up from 53.0 and matched expectations. Keying findings showed “output and new order growth both accelerate”, “input cost and output charge inflation strengthen”. Also from UK, mortgage approvals rose to 66k in August. M4 money supply rose 0.2% mom in August. Eurozone PMI manufacturing was finalized at 53.2 in September, revised down from down from August’s 54.6. Key findings are “exports rise only slightly, weighing on growth of total orders and production”, and, “global trade concerns push confidence down to near three-year low”. Among the countries, German PMI manufacturing was finalized at 25-month low at 53.7. Austria PMI manufacturing dropped to 23-month low at 55.0. Spain reading dropped to 51.4, 25-month low. Italy reading dropped to 50.0, 25-month low. Also from Eurozone, unemployment rate dropped to 8.1% in August, below expectation of 8.2%. From Swiss, PMI manufacturing dropped notably to 59.7 in September, down from 64.8 and missed expectation of 60.8. Retail sales rose 0.4% yoy in August, matched expectations. Japan Tankan large manufacturing index dropped to 19 in Q3, down from 21 and missed expectation of 22. Large manufacturing outlook dropped to 19, down form 21 and matched expectations. Large non-manufacturing index dropped to 22, down from 24 and missed expectation of 22. Non-manufacturing outlook rose to 22, up from 21 and beat expectation of 20. Large all industry capex rose 13.4%, missed expectation of 14.2%. Japan PMI manufacturing was finalized at 52.5 in September. The key points are “output growth sustained amid solid demand pressures”, meanwhile, “input delivery times continue to lengthen sharply”, and “business confidence drops further”. Australian Industry Group Performance of Manufacturing index rose 2.3 to 59.0 in September, indicating faster growth across the sector. It’s now in two years of “uninterrupted expansions”, the longest run since 2005. All seven activity sub-indexes expanded, that is above 50. Five activity sub-indexes accelerated with the new orders sub-index reaching a six-month high. Also from Australia, TD Securities Inflation rose 0.3% mom in September. 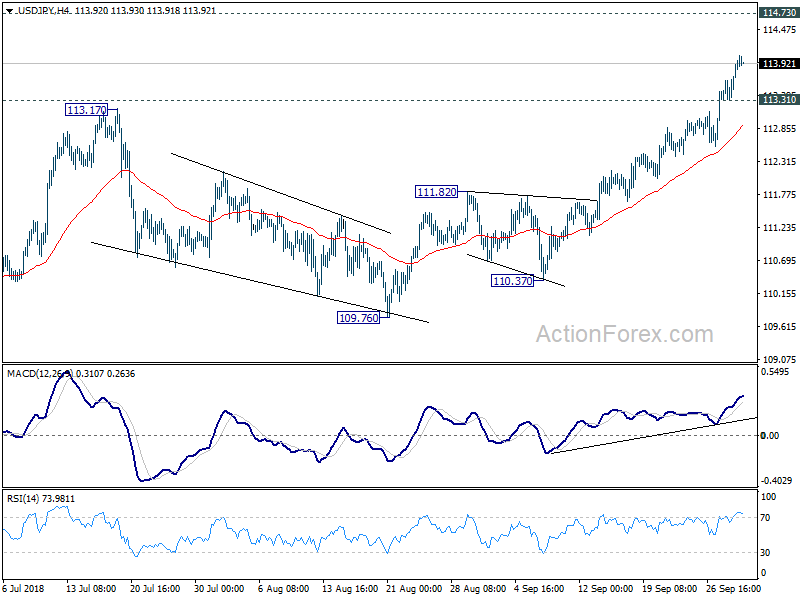 Intraday bias in USD/JPY remains on the upside at this point. 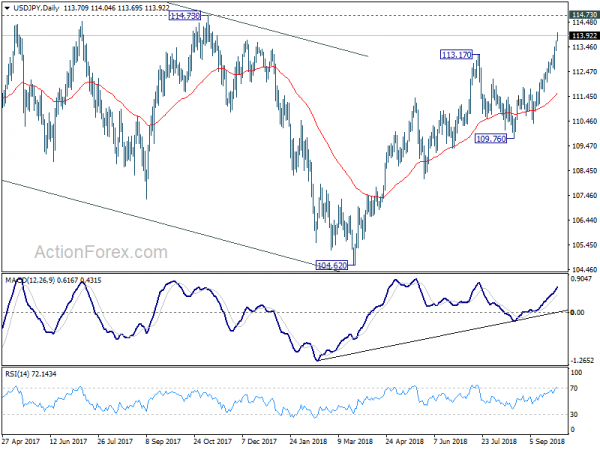 Current rally from 104.62 should target 114.73 resistance next. Decisive break there will confirm larger bullish case. Next target will be 118.65 resistance. On the downside, below 113.31 minor support will turn bias neutral first and bring consolidations, before staging another rally. In the bigger picture, corrective fall from 118.65 (2016 high) should have completed with three waves down to 104.62. Decisive break of 114.73 resistance will likely resume whole rally from 98.97 (2016 low) to 100% projection of 98.97 to 118.65 from 104.62 at 124.30, which is reasonably close to 125.85 (2015 high). This will stay as the preferred case as long as 109.76 support holds.